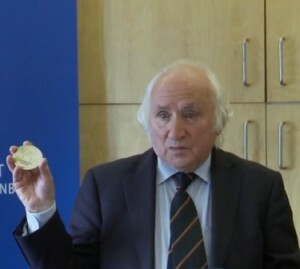 Richard Demarco received his European Citizen’s Medal on Monday 19th August. A ceremony was held at the European Parliament Office, with Scottish MEP Struan Stevenson, who nominated him, presenting him with the medal. Richard Demarco was the co-founder of the Traverse Theatre, and later set up the Richard Demarco Gallery, which helped to promote cultural links with Eastern Europe. The Demarco European Art Foundation is currently exhibiting at Summerhall where it replays its Italo-Scottish Pavilion from this year’s Venice Biennale, entitled ‘Italo-Scotland in Europe, Europe in Italo-Scotland’ following on from the exhibition “Scotland in Europe” at Scotland House, Brussels in 2011.